It has been more than 2 years when Microsoft launched the original Surface Book and earned praises for its new foray into desktop hardware. The company has now updated its Surface Book laptop and launched a more powerful, beefier Surface Book 2. On October 17, at an event in San Francisco, Microsoft announced the Surface Book 2 alongside making the Windows 10 Fall Creators Update available to the general public. Calling it as the “most powerful Surface Book ever,” Microsoft, with this laptop, aims to bring the power of artificial intelligence, machine learning, mixed reality, and immersive gaming to you. It is a hybrid laptop that “empowers the designers, developers, artists, and scientists to imagine and build without limits and without compromises. To achieve more,” the company writes. Microsoft Surface Book 2, which doubles as a tablet, was launched in two sizes (13.5-inch and 15-inch models) with eighth-generation Intel core i7 processors (there are variants with seventh-generation Core i5 processor as well). 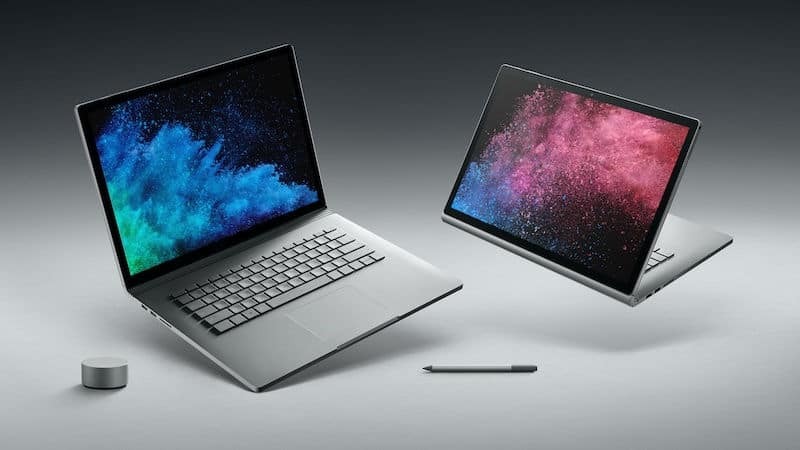 In total, there are seven different variants of the Surface Book 2, offering different processor, RAM and screen sizes ——– 13.5-inch Intel Core i5 (256GB), 13.5-inch Intel Core i7 quad-core (256GB, 512GB, or 1TB SSD), 15-inch Intel Core i7 quad-core (256GB, 512GB, or 1TB SSD). On the processor side, the models with eight generation Intel Core i7 quad-core processors are clocked up to 4.20GHz on Max Turbo. The models with seventh generation Intel Core i5-7300U processor are clocked up to 3.50GHz. All the variants support Wi-Fi 802.11ac, Bluetooth BT4.1 LE, Xbox Wireless built-in (in 15-inch models). The Surface Book 2 has two USB 3.0 Type A ports, and one USB Type-C port. There is a UHS-II SDXC card reader, one 3.5mm headphone jack, 2 Surface Connect, a 5.0MP front-facing camera with 1080p HD video, and an 8.0MP rear-facing autofocus camera with 1080p Full HD video, dual microphones, and front-facing stereo speakers with Dolby Audio Premium. The company is claiming 17-hours of battery life (on continuous video playback). The company says it has also improved the Surface Pen. Preorders of all the variants of Surface Book 2 will start on November 9 (in the United States), with shipping starting November 16. There is no word on India availability yet.